Note: No names are mentioned to protect privacy. 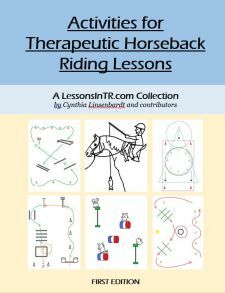 This is a story about how [therapeutic riding] can have a direct and important impact on the life of a rider. I met [my rider], now 12 years old with ASD, a year ago…. He had been riding for almost 2 years and I quickly realized me what a deep connection and love he had for horses. Being intelligent, small, slight, but very athletic, I quickly realized his ability to develop into a talented and athletic independent rider as he built a strong connection with his horse… We started to meet early before our lessons so he could groom, tack, and hang out to talk about things going on in his life. His intelligence was immediately evident and he taught me many facts about prehistoric horses and dinosaurs. And I also learned more about [my rider] and what a deep inferiority complex he had developed over the years. He was fully aware that he was different as he thought and acted differently than others. He had some very negative experiences in school that made his parents realize that home schooling was the best thing for him at this time of his life. Before our lessons, he would refer to the fact that people did not like him and thought he was stupid. He was always afraid that someone would make fun of him if he made a mistake. So the focus of our lessons became not only to help him to become a great rider, but to help him to feel better about himself and to not worry so much about what others thought. Early last summer, we started to think about Special Olympics in the fall. He was at first scared and negative about being able to do this as he realized he would be performing in from of hundreds of people who he thought would make fun of him if he did not do well. After much encouragement, he agreed to participate, so we started to fine-tune his trail pattern and equitation skills. 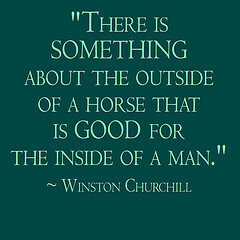 He then had to change his horse to ride [at the Special Olympics] because [his usual horse] was not the best horse to go… This was a hurdle he had to jump over because of his connection with [his usual horse], but it all worked out well and…[it] gave him more confidence that he could be successful with [the new horse] and he was able to bond with him as well. By late September, [this ride] was fully prepared for SO and performed grandly in front of hundreds of people winning two medals. In my opinion, this moment was the catalyst for him to jump to the next phase of his life and be able to eventually start school again. Last summer, I started to talk to his mom more about his school experiences and realized that [this rider] may be ready to start his journey to go back to school where he could be with kids his own age in a learning environment. But there were always the underlying feelings [for this rider] about the fear of being ridiculed by his peers. We discussed his [potential] involvement with [a particular] School where the classes are small and the environment more intimate. They were interested so that conversation developed and he started to make some visits to the [class he would join]. The first time he visited the class, I went with him to give him some extra support. In January, he became a student [at this school]. During one of the early family meetings at [school], he proudly announced that he has ASD and Dyslexia, which is why he sees the world a bit differently. I feel that his experiences at [our barn], being encouraged so strongly by everyone there, and participating in SO changed his life and made him a stronger individual. And to his peers, he is the lucky one who gets to ride horses every week! Having worked with this rider before her, I can say the change in him has been tremendous. Part of this is due to him getting older and more mature, but a big part of it is due to how she worked with him, set goals for him, and cared about his life outside of just riding. Some people need to be taught how to catch negative self talk and replace it with positive self talk. You may be the person to teach them. Encourage them to catch their negative thoughts, and give them examples of thoughts to replace it with. Repeat this so that they hear your positive voice in their head over and over, until they can make that voice their own. Be positive when you are coaching. Be realistic about what they don’t do well. Don’t hide it, but explain it’s no big deal and no one is perfect the first time. Be a good example yourself of positive self talk that your rider can mimic. Set goals for building self confidence and self acceptance. For example, one goal this instructor recently set for this rider is: “This rider will identify 1 thing he did well after each lesson.” If you ask him this right off, he will say usually say “Nothing” and genuinely cannot figure out one thing he did well, so she is starting with giving him several answers to choose from, and will work up to him identifying things without prompting in the future. I hope that helps! What teaching techniques have you used with low-confidence riders?